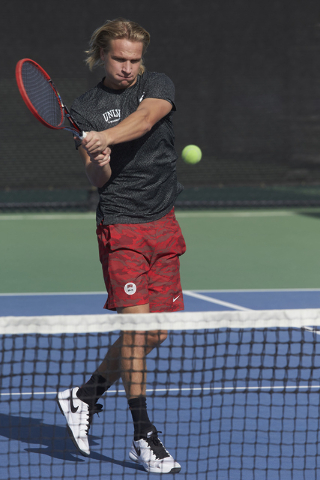 UNLV junior Jakob Amilon’s main goal this season is to help the Rebels earn a spot in the national college tennis rankings. UNLV would certainly attract some attention with an upset of No. 5 UCLA, which it will host for the first time in school history at 1 p.m. Tuesday at the Fertitta Tennis Complex. The Bruins will be the highest-ranked team to take on the Rebels in Las Vegas since 2005, when then-No. 10 Oklahoma State visited. “To play them at home is going to be amazing,” said Amilon, UNLV’s No. 1 player. “It’s a great opportunity to beat a high-ranked team and ranked (individuals). It’s extra motivation because you know they’re so good. In keeping with his home country of Sweden — which besides its bikini team is perhaps best known for being neutral — Amilon is very calm and composed on the court. But Rebels coach Owen Hambrook said his demeanor can be deceiving. Amilon, the team captain, is the only upperclassmen on the roster, which features only one American in freshman Rhett Boss, a Palo Verde High School product. “We’re very young, but very talented,” Hambrook said. UNLV’s No. 2 player is Alexandr Cozbinov, a sophomore who won his first career Davis Cup match this month for his home country of Moldova. Cozbinov blanked Pietro Grass, 6-0, 6-0, in Moldova’s 3-0 victory over the Republic of San Marino. Moldova also beat Malta, 3-0, to win its pool before losing to host Estonia. 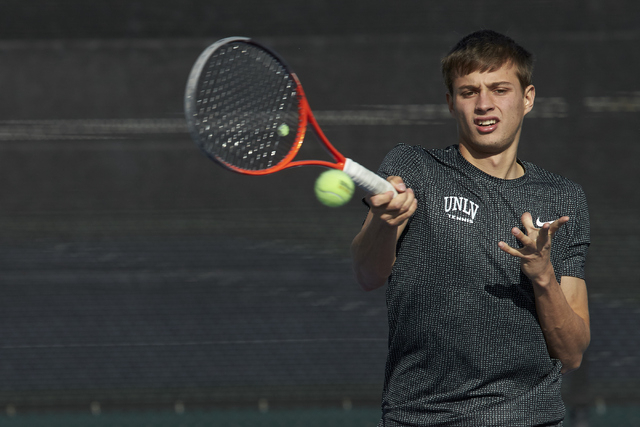 Amilon and Cozbinov have both made big strides at UNLV. Amilon played at the No. 6 spot as a freshman before climbing to No. 3 as a sophomore and to the top spot this season. Cozbinov was at No. 5 as a freshman before ascending to the second spot this season. UNLV (5-5), which lost 4-3 at No. 58 Utah on Friday and 4-3 at No. 59 BYU on Saturday, will host New Mexico at 11 a.m. Friday in its conference opener. The Rebels will host the Mountain West championships from April 29 to May 1. UNLV last won its conference crown in 2007 and Hambrook likes its chances to again contend for the title at home. The No. 59 UNLV women’s tennis team set a school record for most consecutive wins Friday, when it cruised to its 17th straight victory to start the season in a 6-1 win over Montana at the Fertitta Tennis Complex. The Lady Rebels (17-0), who with Wednesday’s 5-2 triumph over Oklahoma tied UNLV’s previous 16-match record win streak set in 1992, will gun for their 18th straight victory at 10 a.m. Saturday at home against Hawaii. Carol Zi Yang, ranked No. 63 in singles, is 18-2, Aiwen Zhu is 21-6 and the Chinese duo is 13-1 as a doubles team. Paola Artiga is 26-4 in singles. Dillon Virva will compete at the NCAA Men’s Swimming and Diving Championships for the fourth and final time Thursday to Saturday in Atlanta. The senior, who won his fourth straight conference title in the 50 freestyle at the Western Athletic Conference championships in February in Houston, is seeded fifth in the nation with an entry time of 19.09 seconds, a UNLV and WAC record. Virva also will swim in the 100 butterfly Friday and in the 100 free Saturday.